Even though I’ve owned horses since 1959, and have participated and audited a variety of horse discipline clinics, I still seek to improve my relationship and connection with the mare I bred and raised; and I’m a Facebook Flunky. As many of you know, I’m developmentally delayed in this department, as I just started on Facebook about two weeks ago. It’s like I have that syndrome Prosopagnosia (Face Blindness), but to Facebook. So, I’m starting a rehab program. I’m actually going to journal regularly. Gulp! 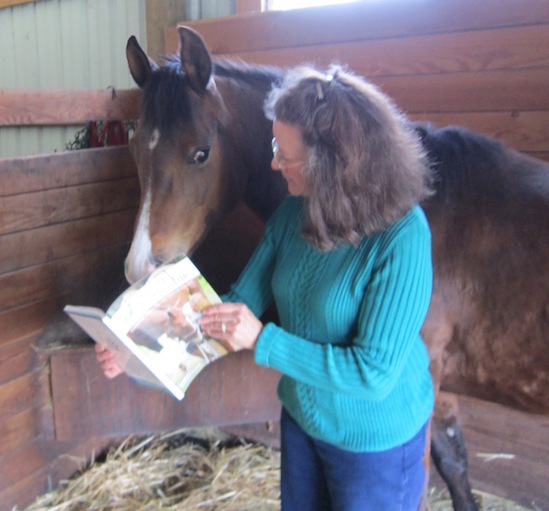 Combining two dreaded things–writing and computer time–is hard for me, but the golden carrot is that I will be writing about improving my relationship with my horse, Lexi, using one of my favorite books, 3-Minute Horsemanship: Groundwork, Ridden Exercises, Real Life Scenarios by Vanessa Bee of England with Lexi (the mare in the photo). Curious? From the look on Lexi’s face, I think she is! I hope you’ll follow the journey. This entry was posted in Build a Better Relationship With Your Horse Series. Bookmark the permalink.